Carmen Caratini walked slowly through the tombstones at Sango Cemetery, a walk she has done hundreds of times over the years, then took a final step forward and stopped as she arrived at her son's grave; this is where she would spend his birthday. Frankie Caratini would've turned 28. His mother now visits this small cemetery in Montgomery County once a week, twice if she has time. It's the only place she feels comfort in the years since her son's murder. "I never thought that I was going to be one of those parents that loses a child, never in my mind. It's the worst pain that somebody can go through. It's very hard to come here, sometimes it's painful, sometimes it's helpful," Carmen says. 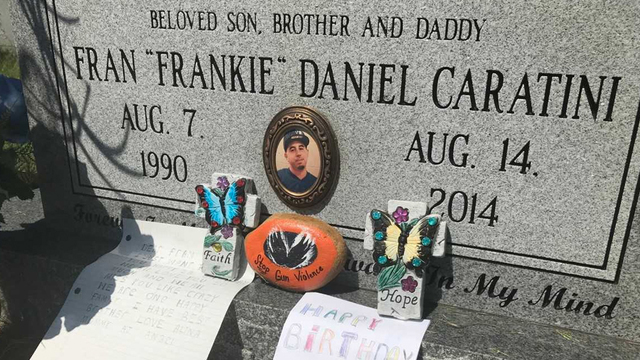 Frankie was 24-years-old when he was shot and killed on August 14, 2014 -- seven days after his birthday. The young father of two was shot outside an apartment complex off Chapel Road in Clarksville. Four years later, his murder remains unsolved. "A lot of people were there and that hurts, nobody wants to talk," Carmen says holding back tears. "I should be happy at home with him, with his babies. Not here at this cemetery, no mother wants to spend a birthday here," she adds, the pain palpable as the words leave her mouth. Clarksville Police are still investigating Frankie's death, one of only two unsolved murders in 2014, but without new information or leads, solving the case has proven difficult. "I want who did this to my son to pay for it, to show people that life matters."